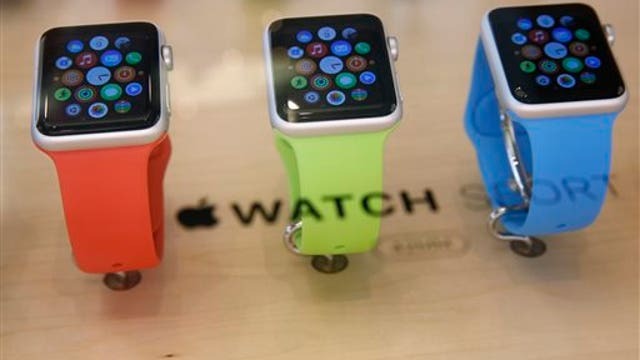 The Apple Watch is out for pre-order, but customers may not see it for several weeks. FBN’s Cheryl Casone with the story. Consumers flocked to Apple Inc&apos;s (NASDAQ:AAPL) stores around the world on Friday to get the first close-up look at the tech giant&apos;s smartwatch, which the company expects will be its next runaway hit. The Apple Watch, CEO Tim Cook&apos;s first new major product and the company&apos;s first foray into the personal luxury goods market, was available for pre-order online and to try out in stores -- but not to take home. On April 24, consumers will be able to buy it online or by appointment in shops including trendy fashion boutiques in Paris, London and Tokyo, part of Apple&apos;s strategy of positioning the wearable computer as a must-have accessory. Testing Apple&apos;s mastery of consumer trends, the watch is an untried concept for the California-based company. It straddles a technology market accustomed to rapid obsolescence and luxury goods whose appeal lies in their enduring value. Before the Paris Apple store opened at 0900 local time, about 100 people were queuing outside. Staff cheered and applauded the first customers, most of them men aged under 30. "I have everything from Apple so now I need to get the watch," said 19-year-old Jeremy Dugue wearing an Armani leather jacket after ordering the stainless steel model at 1,149 euros. The Apple Watch sport starts at $349 while the standard version comes in at $549 in the U.S. High-end "Edition" watches with 18-karat gold alloys are priced from $10,000 and go as high as $17,000. Within the first hour in Paris, many customers had pre-ordered their watch, and several went for the entry-level model with a black plastic bracelet. High demand means some shoppers in Paris will have to wait 4-6 weeks before their watch arrives. "It was comfortable, I didn&apos;t think it would be that comfortable. It&apos;s an easy way of managing your busy life," said 19-year old student Omar Alborno, one of the first to try on the watch at London&apos;s luxury Selfridges department store. Earlier on Friday, Apple&apos;s flagship store in Sydney&apos;s financial district was packed with those hoping to get the first peek at the device, although just around 20 die-hard fans queued out front, modest by the standards of a major Apple launch. million. By comparison, Apple sold nearly 200 million iPhones last year. Apple&apos;s watch is widely expected to outsell those by Samsung <005930.KS>, Sony Corp <6758.T> and Fitbit, that have attracted modest interest from consumers. It will likely account for 55 percent of global smartwatch shipments this year, according to Societe Generale. "Apple will outsell its wearable rivals by a very wide margin but it will do this on the power of its brand and its design alone," independent technology analyst Richard Windsor said. "Consequently, I am sticking to my 20 million forecast for the first 12 months and see the potential for some sogginess in the stock as reality sets in."